Square Enix is promoting a special pre-order bonus for all recent and existing pre-orders in European territories of the standard, limited, and collector’s editions for Kingdom Hearts HD 2.5 ReMIX. 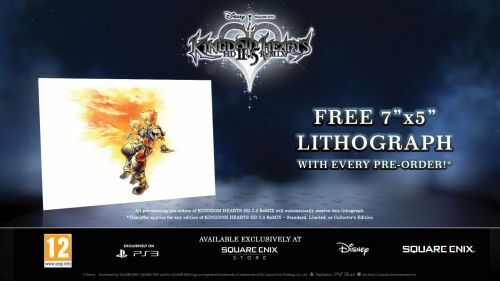 Fans will be receiving a free 7×5″ lithograph with the menu art from Kingdom Hearts 2 Final Mix+, showing Sora and Roxas eating Sea Salt Ice Cream with in Twilight Town. Many thanks to KHWorld for the heads up. Kingdom Hearts HD 2.5 ReMIX reaches audiences beyond Japan in a little more than a week away! For the latest news on Kingdom Hearts HD 2.5 and on future entries, stay charged with us at KH Recharged – bringing you closer to the future of the Kingdom Hearts series. Is this for every where or just Europe? ‘Cause when I first saw this about a week ago and did some more research on it, it was only for Europe….. Unfortunately, Square-Enix commented on the matter at the lot. The marketing team did not know about anything of giving out the lithograph in North American territories. So only those who went to the “Inside the Kingdom, With Heart” event in Burbank, California, and pre-ordered it in Europe got the lithograph. We apologize for the misinformation. The post will be changed now. Thank you for your insightful question Travis.